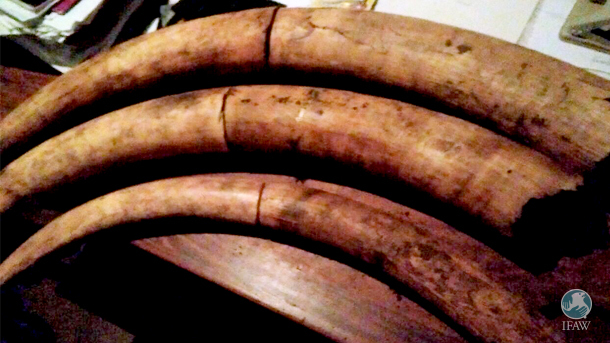 A young Zambian National has been arrested after an attempt to traffic poached ivory across the Zambia-Malawi Border. The arrest, which took place on May 10, was the result of a lead uncovered by the Wildlife Crimes Investigations Unit (WCIU) operating throughout Zambia and Malawi. . The WCIU has been established jointly by Malawi’s Department of National Parks and Wildlife (DNPW) and the Malawi Police Service (MPS) and has established a broad and reliable informant network throughout Zambia and Malawi that alerts officials of illegal trade activity. Thanks to an informant, officers were able to arrest the trafficker 15 kilometres from the border in the township of Mchinji, where the dealer was in search of potential buyers. The 27 kilograms of poached ivory represents no less than five slain elephants—a tragic and senseless loss to Zambian Wildlife. IFAW and its partner organisation, the Lilongwe Wildlife Trust, support the WCIU. Wildlife products flowing over the Malawi border from all corners of Africa is bordering on epidemic proportions. It is the 37th arrest for the WCIU in 2017 alone. IFAW has responded to this crisis by directing resources to cross border investigations and operations, training Zambian and Malawian rangers, creating a reliable informant network and a dedicated law enforcement team free of corruption. IFAW also works to increase penalties handed out to poachers, dealers and traffickers of endangered wildlife, which helps change the ‘low risk – high gain’ culture of the trade. The suspect faced court on May 18, where a top investigator gave evidence against the trafficker. The suspect was denied bail and sentencing has been scheduled for tomorrow, when he will be dealt his fate alongside three more traffickers arrested by the WCIU earlier this month. I am confident the four offenders, who together are responsible for the cruel slaughter of 11 elephants, will receive sentences of at least four or five years apiece. Such a penalty is in direct contrast to what was previously seen in such cases. Poachers, dealers and traffickers often escaped prosecution or were merely given a fine. This is a huge success for IFAW and the WCIU and proof that, because of its relentless presence, Malawi now recognises poaching and trafficking as a serious crime. But most importantly, it is justice for the beautiful lives of 11 elephants that were victims of illegal wildlife trade.